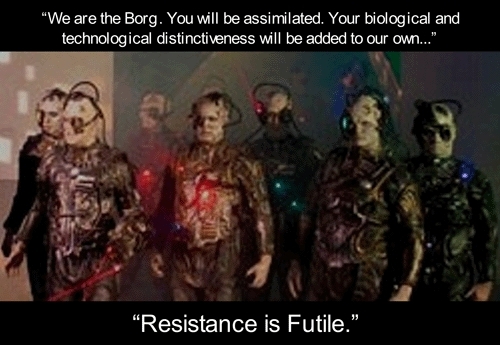 Star Trek’s The Borg have a few things going for themselves. We should always be seeking a path of thought that results in value. But we should not be always seeking for a new shiny just because it exists. This is a fine line, consider what is out there that might help us, but don’t forget everything we have already learnt already that works well. Now the Borg’s approach to gathering this information isn’t the best example, especially given that at the point of assimilation all innovation in relation to that practice or technique was halted. When looking at something new as an Agilist don’t forget to potentially innovate the idea further! The second concept that I love about the Borg is the idea of the hive mind or collective thought. All too often the conflicts that we see within a team is as a result of misunderstandings between people. If we all understood exactly what someone was thinking all of these frustrating dramas would not exist. Alas a collective understanding won’t happen through any means other then bloody hard effort on the part of the Agile team. Team members need to appreciate that everyone is unique. Everyone thinks differently. We are influenced by our childhood, our basic neurological pathways, our friends, family, core beliefs and our passions. When collaboration is not at its most optimum is the time that we need try and take a step into the other person’s shoes. Take a breath and count to ten and react from logic (like the borg) rather than emotion. The third concept about the Borg is that they worked well as a team, always focussed on a common goal. Thinking about their motivational factors from Daniel Pink’s Drive work – autonomy, mastery and purpose, those little nanoprobes had their work cut out for them. Autonomy was taken out, their purpose wasn’t very transcendental, but their mastery motive was very strongly in play with a constant search for perfection. The last concept about the Borg that I like is their perseverance. They believe their approach is right and their passion towards reaching that goal is limitless. Now in natural culture change if someone doesn’t want to go Agile then it is going to be a tough struggle and unlike the borg, sledgehammering an unwanted approach is never a good idea; but despite all efforts of resistance to assimilation the borg never gave up, even coining the catchphrase ‘Resistance is futile’.